A tea lady provides drinks in an office, factory, hospital, or other place of work. The role under this name began in Britain during World War II, and continues in the National Health Service today. It used to be a wide-spread occupation for women, and as such was well represented in popular culture. 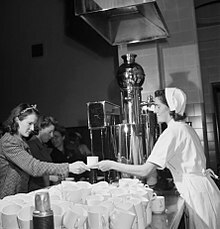 Tea ladies entered the mainstream in the UK during the Second World War, when they were used in an experiment to boost efficiency in workplaces for the war effort. They had such a hugely positive effect on morale they became commonplace in all areas of work, mobile canteens even serving military units on exercises. They were present in a works canteen or perhaps came round with a trolley, on which was usually a tea urn full of either hot tea or hot water, and perhaps a selection of cakes and buns. This occupation began to die out in the late 1970s to early 1980s when tea ladies began to be replaced by private catering firms and vending machines, as businesses expanded and women moved into different jobs. The tradition of the tea break, from which the role of tea lady rose, has itself declined, also offering a possible explanation why tea ladies are not commonly found today. In Britain, market research in 2005 showed that of those workers who drank more than four cups of tea a day, only 2% of them received it from a tea lady, whereas 66% received it from an urn, and 15% from a vending machine. In Australia, Jenny Stewart, Professor of Public Policy in the University of New South Wales, uses the decline of the tea lady as an example of "managerial solipicism": they provided civil servants with dependable "patterns of civilised sociability" at "significant economies of scale", but "they just faded away, as departments searched for easy ways of making savings". Tea ladies still exist in the National Health Service (NHS). Some hospital tea trolleys are operated by the Royal Voluntary Service. Patients often comment on the tea ladies, and how their care made a hospital stay more bearable. In the past they were often used as stereotypical figures in British comedy, with a tea lady usually portrayed as a harassed, overweight, middle aged woman in a uniform and cap, or as a very pretty recipient of all sorts of lewd comments from the workforce, as in the film Carry On at Your Convenience (1971). In Australia, a sitcom called The Tea Ladies aired in 1978. Tea ladies in general were a frequent target of illusory "cuts" and "economies" in Yes Minister, frequently conjured up by Nigel Hawthorne's character Sir Humphrey Appleby, but a tea lady was only once seen onscreen during the whole five-series run of the show, sharing a lift with Jim Hacker and Sir Humphrey Appleby in the episode "The Skeleton in the Cupboard" (1982). In association football, media and fans often blame "the tea lady" for leaking information about player transfers to the public, regardless of whether or not team managers actually have a tea lady. ^ "Your Mobile Canteen in Action". Imperial War Museum. Retrieved 2010-07-25. ^ "Research carried out for tea4health in April/May 2005 by NOP on 1,000 adults". UK Tea Council. 2005. Retrieved 2007-02-17. ^ Stewart, Jenny (2004). The Decline of the Tea Lady: Management for Dissidents. Wakefield Press. p. 21. ^ Flaxman, Peter (2009). Flaxman's guide to surviving an nhs hospital stay. p. 35. ISBN 9780956155504. ^ "Royal Voluntary Service - Hospital trolleys". www.royalvoluntaryservice.org.uk. Retrieved 25 July 2018. ^ "How the NHS helped me fight back - Kent Community Health NHS Foundation Trust". Kent Community Health NHS Foundation Trust. Retrieved 4 March 2018. But these complete strangers were incredible. Even down to the tea lady who saw I was struggling to drink so tried every cup they had until we hit one with a spout which helped me swallow. And once she had discovered the cup that worked the best, she kept it aside for me. How’s that for putting the patient at the centre of their care? To me, it really made a difference. ^ Cumber, Robert (19 January 2017). "Tea lady at Sheffield hospital hailed as unsung hero of the NHS". The Star. Retrieved 4 March 2018. ^ "The Tea Ladies". IMDB. Retrieved 4 March 2018. This page was last edited on 26 October 2018, at 01:56 (UTC).